Sigmund Freud is most famous for his psychoanalytic school of thought, but he also took a keen interest in religion. As an adult, Freud considered himself an atheist, but his Jewish background and upbringing and background played an important role in the development of his ideas. He even wrote several books focused on the topic of religion. Learn more about Freud's complicated relationship with religion as well as some of his thoughts on religion and spirituality. 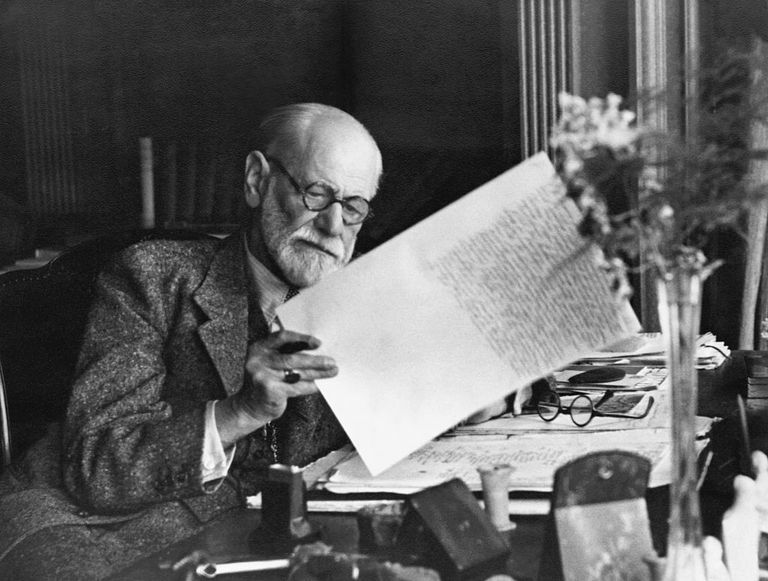 Sigmund Freud was born to Jewish parents in the heavily Roman Catholic town of Freiburg, Moravia. Throughout his life, Freud endeavored to understand religion and spirituality and wrote several books devoted to the subject, including "Totem and Taboo" (1913), "The Future of an Illusion" (1927), "Civilization and Its Discontents" (1930), and "Moses and Monotheism" (1938). Religion, Freud believed, was an expression of underlying psychological neuroses and distress. At various points in his writings, he suggested that religion was an attempt to control the Oedipal complex (as opposed to the Electra complex), a means of giving structure to social groups, wish fulfillment, an infantile delusion, and an attempt to control the outside world. While he was very upfront about his atheism and believed that religion was something to overcome, he was aware of the powerful influence of religion on identity. He acknowledged that his Jewish heritage, as well as the antisemitism he frequently encountered, had shaped his own personality. "My language is German. My culture, my attainments are German. I considered myself German intellectually until I noticed the growth of anti-Semitic prejudice in Germany and German Austria. Since that time, I prefer to call myself a Jew," he wrote in 1925. So how did Freud feel about religion? In some of his best-known writings, he suggested that it was an "illusion," a form of neurosis, and even an attempt to gain control over the external world. In "The Future of an Illusion," Freud wrote that, "Religion is comparable to a childhood neurosis." "Moses and Monotheism" was one of his final works prior to his death. In it, he suggested that, "Religion is an attempt to get control over the sensory world, in which we are placed, by means of the wish-world, which we have developed inside us as a result of biological and psychological necessities. [...] If one attempts to assign to religion its place in man's evolution, it seems not so much to be a lasting acquisition, as a parallel to the neurosis which the civilized individual must pass through on his way from childhood to maturity." While fascinated by religion and spirituality, Freud was also at times quite critical. He critiqued religion for being unwelcoming, harsh, and unloving toward those who are not members of a specific religious group. From "The Future of an Illusion" (1927): "Our knowledge of the historical worth of certain religious doctrines increases our respect for them, but does not invalidate our proposal that they should cease to be put forward as the reasons for the precepts of civilization. On the contrary! Those historical residues have helped us to view religious teachings, as it were, as neurotic relics, and we may now argue that the time has probably come, as it does in an analytic treatment, for replacing the effects of repression by the results of the rational operation of the intellect." Some of his most critical comments can be found in his text "Civilization and Its Discontents." "The whole thing is so patently infantile, so foreign to reality, that to anyone with a friendly attitude to humanity it is painful to think that the great majority of mortals will never be able to rise above this view of life," he suggested. "It is still more humiliating to discover how a large number of people living today, who cannot but see that this religion is not tenable, nevertheless try to defend it piece by piece in a series of pitiful rearguard actions." "The different religions have never overlooked the part played by the sense of guilt in civilization. What is more, they come forward with a claim...to save mankind from this sense of guilt, which they call sin." Freud's psychoanalytic perspective viewed religion as the unconscious mind's need for wish fulfillment. Because people need to feel security and to absolve themselves of their own guilt, Freud believed that they choose to believe in God, who represents a powerful father-figure. Novak D. On Freud's Theory of Law and Religion. International Journal of Law and Psychiatry. 2016;48:24-34. doi:10.1016/j.ijlp.2016.06.007.